There are many factors that go into improved physical performance, recovery being one, stretching another. A good night’s sleep is vital in allowing the body to rest, relax and rebuild, stretching in order to improve flexibility, range of motion and injury prevention. Incorporating stretching into your daily workouts is a given but including it in your daily routine just before sleep is a very effective way to relax your muscles and increase blood flow and nutrients to your cartilage and muscles. The chest muscles can become tight from sitting at a desk for prolonged periods of time, causing the shoulders to roll forward and muscles of the upper back to become stretched and weakened. This stretch targets those muscles of the chest – the pectoralis major and pectoralis minor. Hamstring strains are a common training and sport injury, with research showing that shortened muscle length is one of the common risk factors. Tight hamstrings can limit your ability to use your gluteal muscles and both groups of muscles are key in “hip extension”, which in turn is an important action in walking, running, squating and basically any lower body movement. If the gluteal muscles aren’t working well, the hamstrings will have to work twice as hard to do the same job, so its an important area to focus on. The cat-cow position helps to improve mobility throughout your spine and teaches you to differentiate between various movements in these segments. This stretch can help with lower back pain and the synchronised breathing assists with relaxation. The bretzel stretch is great for improving your upper back (thoracic spine) and hip mobility, both areas of your body which can become stiff from prolonged sitting as well as regular use in physical activity and exercises. Inhale as you return to the starting position and repeat for 3-5 breaths. Repeat with the other leg. To target the quadriceps and hip flexors as you rotate, bend your right knee and use your left hand to pull your leg as close to your hips as possible. Try to to build these stretches into your nightly routine, not long before bed and I’m sure that you’ll start to move better, perform better and sleep better. Kassandra is an Accredited Exercise Physiologist at Precision Physio, Concord. She has a Bachelor of Applied Science (Exercise Physiology) from the University of Sydney and competes as an Under 63kg Powerlifter. In high-performance settings, Exercise Physiologists provide a vital link between the work done by both physiotherapists and conditioning coaches, bringing together a detailed understanding of how the body moves and what is required to train and develop towards specific physical goals. Kassandra is a highly regarded practitioner currently working with a mix of talented athletes and active everyday people looking to move more efficiently or with reduced pain. She has a particular focus on musculoskeletal conditions and through experience and her own training, can easily relate with patients and athletes no matter their goals, strengths or limitations. 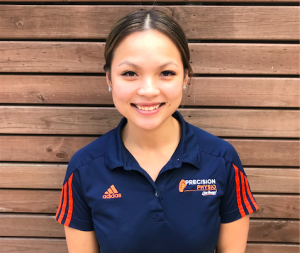 If you would like more individualise guidance and advice from Kassandra, you can contact her at Precision Physio, Concord: 02 9736 3950 | http://www.precisionphysio.com.au.